Bisibelath is a traditional dish of karnakata with millets instead of rice, with oats and lentil and a combination of spices & condiments, contributing to an unique flavor and taste. Its ready to cook and delicious. To make it healthier, we have used Millet instead of rice. Try mouth watering recipe from Ammae. Step 1: With every 1 measure of Ammae Bisibelabath mix add 3 measure of water and add fresh cut vegetable (carrot, beans, capsicum, potato). Step 3: Pressure cook for 5 whistles. After removing, add required ghee, curry leaves for taste. 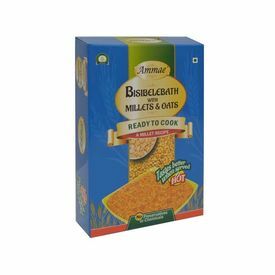 Millet Bisibelabath Net Weight : 150 gms each pack - 2 packs as a Unit Best Before : 3 months from Packing Delicious millet recipe with no rice added Bisibelath is a traditional dish of karnakata with millets instead of rice, with oats and lentil and a combination of spices & condiments, contributing to an unique flavor and taste. Its ready to cook and delicious. To make it healthier, we have used Millet instead of rice. Try mouth watering recipe from Ammae. Millet Bisibelabath, Simple preparation Prepartion time - 20 min Step 1: With every 1 measure of Ammae Bisibelabath mix add 3 measure of water and add fresh cut vegetable (carrot, beans, capsicum, potato). Step 2: Mix the ingredients well close the lid of the container. Step 3: Pressure cook for 5 whistles. After removing, add required ghee, curry leaves for taste.